8th June 2018, New Delhi: It is that time of the year when the new sessions in schools are about to start and along with new books and school dress, parents receive the ‘fee increase’ letter from the school. Protests have been reported from different parts of the country on unfair fee hike. In many states parents have collectively met the Chief Ministers to complain about this yearly event which puts a lot of strain on their pockets. 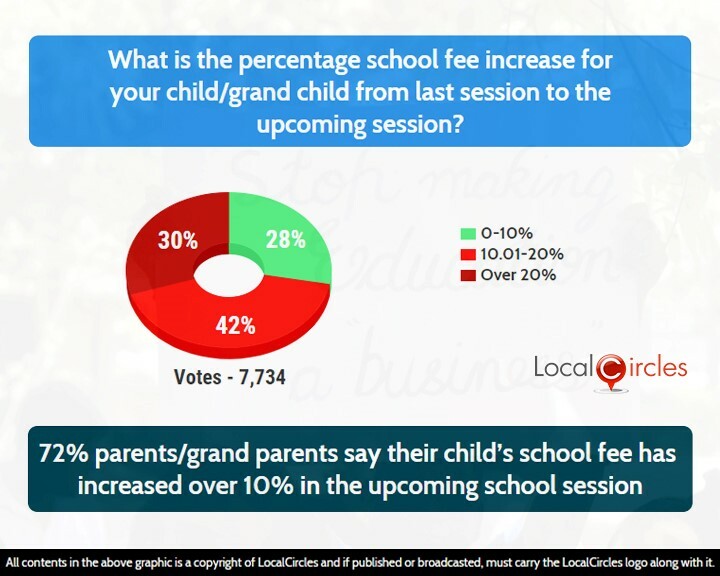 LocalCircles conducted its annual school fee survey which received more than 29,000 votes. In the first poll, 42% voters said that the school fee increase for their child from last session to upcoming session is 10.01% - 20%. 30% said it is over 20% while 28% said it is in the range of 0-10%. Recently, coming down heavily on 449 private schools in New Delhi for not refunding extra fees taken from students, Delhi Chief Minister Arvind Kejriwal had threatened them of dire consequences if they don’t comply with court orders or refund money. 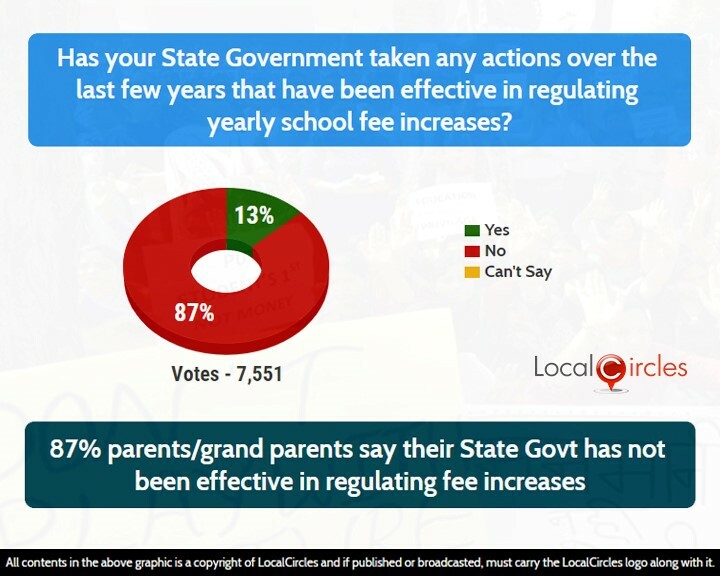 In the second poll, 87% people said that their state government has not taken any actions in the last few years that have been effective in regulating yearly school fee increase. Only 13% said that something was done. The UP government had earlier introduced the Self-Financed Independent Schools (Regulation of Fees) Bill 2017. Although parents had expected a lot for it, in reality it did not have much effect. 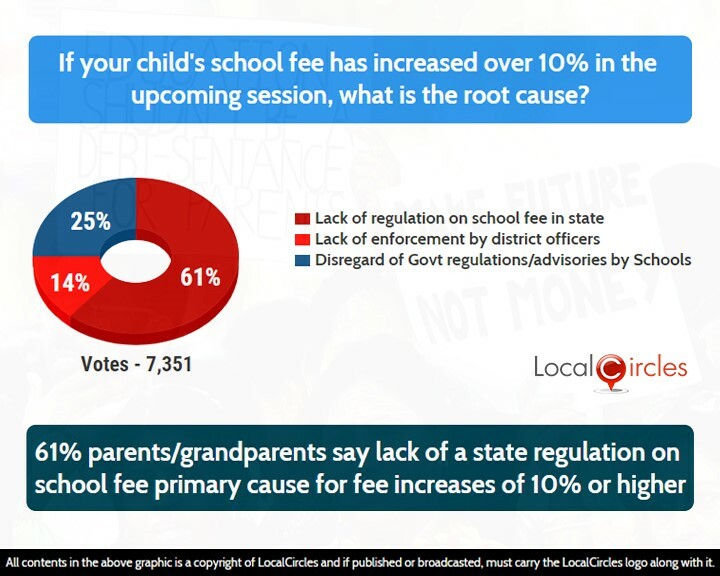 The following question asked people if their child’s school fee had increased over 10% in the upcoming session, what is the root cause. 61% said it is due to the lack of regulations on school fee in state and 14% its due to the lack of enforcement by district officers. 25% said it is due to the disregard of government regulations/advisories by schools. When the Sixth Pay Commission was implemented in 2008, private schools also had to increase their teachers' salary. Many of them cited lack of funds for the fee increase, but it was clearly not the case. The final question asked what according to them should be the school fee increase model. 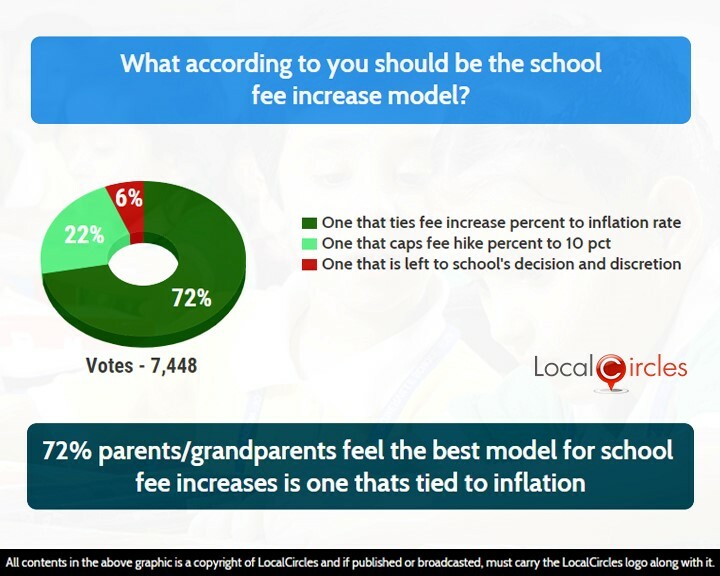 72% said it should be the one that ties school fee increase percent to the inflation rate and 22% said it should be the one that caps fee hike increase percent to 10%. A small 6% said that it should be left at the school’s decision and discretion. 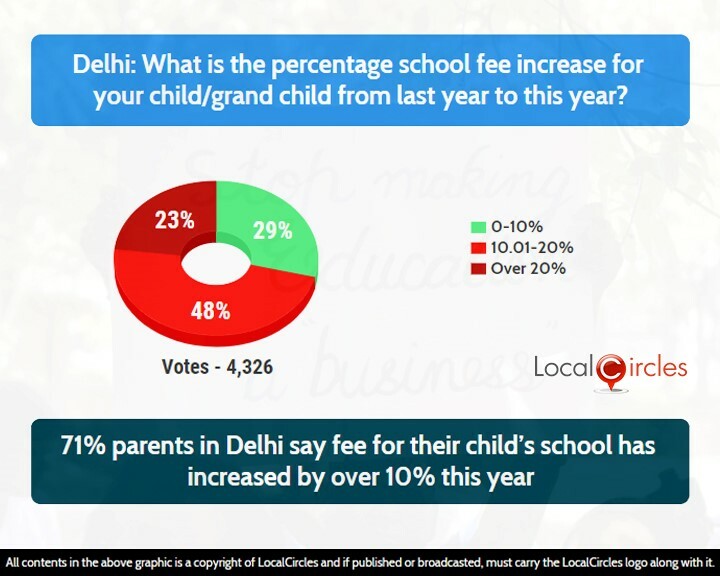 In Delhi, residents were asked what the percentage school fee increase is for their child from last year to this year. 29% said it was below 10% while 48% said the increase was between 10.01% - 20%. 23% said the increase was more than 20%. In Haryana, residents were asked what the percentage school fee increase is for their child from last year to this year. 43% said it was below 10% while 14% said the increase was between 10.01% - 20%. 43% said the increase was more than 20%. In Maharashtra, residents were asked what the percentage school fee increase is for their child from last year to this year. 53% said it was below 10% while 29% said the increase was between 10.01% - 20%. 18% said the increase was more than 20%. In Telangana, residents were asked what the percentage school fee increase is for their child from last year to this year. 20% said it was below 10% while 60% said the increase was between 10.01% - 20%. 20% said the increase was more than 20%. 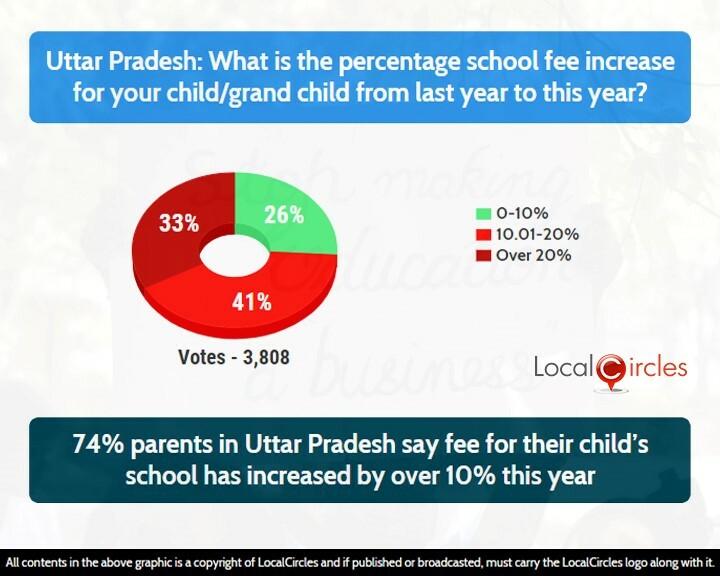 In Uttar Pradesh, residents were asked what the percentage school fee increase is for their child from last year to this year. 26% said it was below 10% while 41% said the increase was between 10.01% - 20%. 33% said the increase was more than 20%. The government will have to take some strong steps to find a solution to the unfair fee hike issue. LocalCircles will be sharing the findings of this report with the Ministry of Human Resource Development so that the citizen inputs can be considered before taking action on the issue.